Growing plants indoors and outdoors in containers is becoming more popular all the time, and it is easy as well as rewarding. Using EKO Organic Potting Mix takes the guesswork out of planting, because it contains everything your plants need to be beautiful, strong and healthy. Due to it’s unique organic components, EKO Organic Potting Mix is the ideal mix for all types of plants. It offers nutrient value not found in most potting mixes. 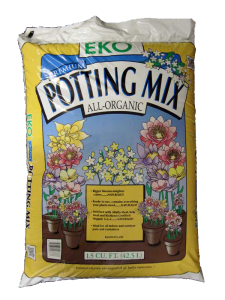 Place your plants directly into EKO Organic All Purpose Potting Mix, and water in. Plant at a depth according to instructions provided by your local nursery, or information on identification tag. There is no need to mix any other soils with this mix. Simply plant directly in the soil, and water. EKO Organic Potting Mix contains three organic fertilizers (dehydrated poultry waste, kelp, and alfalfa meal) to get your plants established and off to a great start. After about four weeks begin regular fertilization with a high-quality plant food that has the most suitable analysis for the type of plants you are growing. Lastly, sit back and enjoy the results of using this high quality Colorado-made product. Available in 1.5cu ft, 20qt, and 8qt sizes.